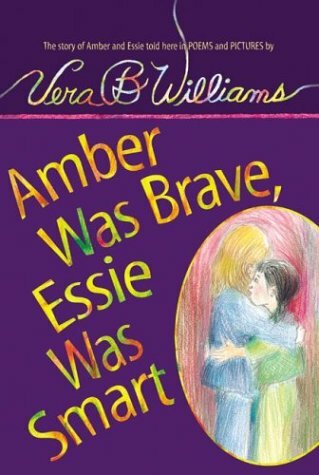 I haven't read many novels in verse that are written for the very young, so it was interesting to see how similar Amber Was Brave, Essie Was Smart was to the other books I've been focusing on. The most important similarity is that these books don't shy away from difficult topics. Even though it is appropriate for second grade readers, the novel describes two sisters who spend most of their time alone because their father is in jail for forging a check and their mother works all the time. The girls' reality is harsh: there is never enough food, sometimes the utilities get shut off, and there are rats in the walls. Yet the poems are uplifting because Amber and Essie are imaginative and able to create their own world. Accompanied by author Vera B. Williams' sketch-like illustrations, this is a book that can be enjoyed on multiple levels. It's worth checking out of the library to share with the young readers in your life.